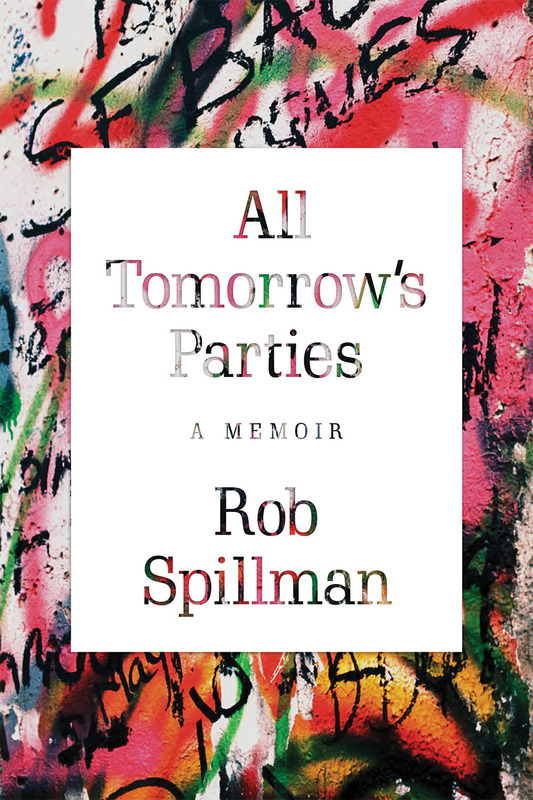 From Baltimore Punk clubs to the ruddy streets of pre-reunification East Berlin, All Tomorrow’s Parties follows Rob Spillman’s search for creative authenticity and inspiration in the music and literature around him. Having spent a large portion of his childhood in Berlin living with his father, Rob was deeply moved upon seeing the wall come down in 1989. Watching the news in an East Village bar, Spillman recounts: “I couldn’t hear what the exuberant kids on the Wall were yelling, but I felt like they were calling me: Come home Rob. Come home.” Fantasizing about Hemingway’s Paris and tales of Kerouac and Hunter Thompson’s adventures, twenty-five year old Rob and his new wife Elissa set out for Germany to live among the local artists and writers who, having lived under Stasi oppression, were now free to dream bigger. “I was possessed by what the Germans call Sehnsucht,” Spillman writes, “one of those wonderfully untranslatable words that combines longing and nostalgia for a home that one doesn’t even know is one’s home.” This concept proves to be the central theme of the memoir, as well as the possibility that Spillman might be misinterpreting his own lack of commitment and contentment as some kind of Sehnsucht. Where is home? At a rave in Berlin, in the tunnels underneath the Wall? Or at the community-run East Berlin bar that somehow got a hook-up of West Berlin wine? Rob grows increasingly enamored with the idea that his abstract home might be hidden in a favorite book or song, that there might be a way to live among the artistic and cultural fantasies that once transported him. “This must be the place,” he says in the memoir’s opening line, but perhaps the coolness of connecting to a Talking Heads song means more to him than the actual substance of the quote. Rob’s stories with Elissa and their travel companion Hank in East Berlin are fascinatingly informative and provide a unique new take on the writerly ex-pat fantasy. Some of the richest moments in All Tomorrow’s Parties are Spillman’s conversations with locals and his descriptions of East Berlin’s efforts to return to normalcy. Rob, returning to the Berlin of his past, provides a curious parallel to the city’s efforts to go back to something familiar. 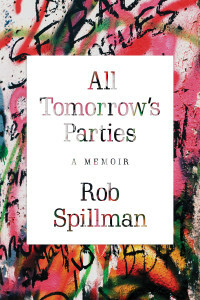 All Tomorrow’s Parties is swollen with nostalgia and alternates in quick, episodic chapters between East Berlin and Spillman’s childhood years in New York, Aspen, and Baltimore. He recounts his parents’ divorce, his father’s coming out, his summers working at Chattaqua with his dad and his teenage years floating through high school while living with his mother, all of which provided formative experiences for Rob, desperate to find some kind of stability. But the memoir suffers from a slight imbalance between these two threads. Rob and Elissa’s experience in East Berlin is unquestionably extraordinary, but it’s difficult to read a matching page count of artsy high school stories with equal enthusiasm. “My second year in Baltimore was much like the first,” he recalls, “forgettable.” Scenes of thirteen-year-old Rob trying to smoke pot with the cool kids, “trying to look pro as I tentatively pinched the joint between my thumb and middle finger,” are hardly remarkable, and Rob’s “coughing and hacking” signals that this episode, like many from what eventually grew to be the author’s typical suburban youth, is one of the superfluous ones. These shruggable moments are unfortunately not the only anemic minutiae that hinder the success of the memoir. Each chapter begins with an inspirational quote about music or writing and a corresponding “soundtrack” cut: the songs are often obvious picks: Chapter 20’s soundtrack is Kraftwerk’s “Autobahn”, for instance, and in that chapter Rob and Elissa drive into Berlin. After an absinthe binge, they wake up in a chapter that begins with a Lewis Carroll quote and “White Rabbit” listed as the corresponding tune. With over 60 chapters in the memoir, these quotes and songs blur together into something that resembles an edgier Forrest Gump soundtrack, and they provide little contribution to anything. As Spillman’s flashbacks catch up to his present, the memoir takes a strange turn and focuses on Rob’s marathon-caliber athleticism and obsession with running. He repeatedly tells readers he was running 90 miles a week (often two runs a day, we’re told a few times), and even gives us his fastest mile (a wild 4:24). Although indulgent, all this is used to render Rob as a sort of cultural, philosophical “runner”: always on the move, racing towards or fleeing from some kind of abstract gate. This ties the memoir up nicely, but seems like an arbitrary finish for a book that could have used a more remarkable encore.